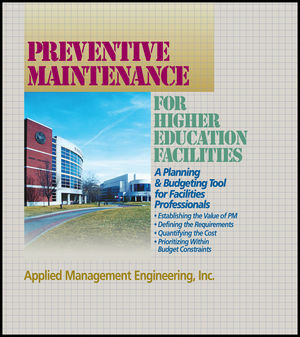 This unique publication gives you the tools you need to establish the value of PM, and to develop and budget for an appropriate PM program for your college or university. The authors, whose clients include more than 25 leading colleges and universities, have provided an easy-to-use tool to help you conquer the challenges of PM in higher education. The book includes interactive models for the primary functional building types found in different-sized higher education facilities. 13 interactive Functional Building Models for small-to-large colleges and universities. 50 PM checklists that provide the specific tasks, associated labor hours and costs — and recommended frequencies — from weekly to monthly, quarterly and annually.
. . . all in electronic format from the program's dedicated Website . . . and on heavy-stock paper for easy photocopying. Selling the need for PM to the governing body, including identifying the impact if a PM program is not implemented. Defining the annual cost of PM, in labor and materials. Prioritizing PM tasks to fit your budget — based on accepted equipment maintenance practices. Selecting a CMMS and incorporating PM into the program. Applied Management Engineering, Inc. (AME), headquartered in Virginia Beach, Virginia, specializes in facilities management consulting services. Established in 1980, AME provides services including condition assessments, facility management training, maintenance and repair cost estimating, preventive maintenance, and development of maintenance management software. Among AME's clients are federal, state, and municipal entities, as well as numerous college and university facilities throughout the U.S., including Duke University, Brown University, University of Vermont, University of Rochester, University of California at Berkeley, Ohio University. University of Massachusetts, San Jacinto College, Northwestern University, and the Virginia Community College System. PM8.2-250-1950: Fire Pump, Electric Motor Driven. PM8.2-270-1950: Fire Alarm Annunciator System. PM8.2-275-1950: Fan, Roof Smoke Exhauster. PM8.3-120-2950: Boiler, Hot Water; Oil, Gas or Combination Fired. PM8.3-120-3950: Boiler, Hot Water; Oil, Gas or Combination Fired. PM8.3-120-4950: Boiler, Hot Water; Oil, Gas or Combination Fired. PM8.3-160-4950: Boiler, Steam; Oil, Gas or Combination Fired. PM8.3-160-4975: Boiler, Steam; Oil, Gas or Combination Fired. PM8.3-710-3950: Pump, Steam Condensate Return. PM8.4-020-1950: Pump, Storm Water, Simplex Lift Station. PM8.4-020-2950: Pump, Storm Water, Duplex Lift Station. PM8.4-220-2950: Chiller, Centrifugal Water Cooled. PM8.4-230-2950: Chiller, Reciprocating, Air Cooled. PM8.4-240-2950: Chiller, Reciprocating, Water Cooled. PM8.4-510-2950: Cooling Tower, Forced Draft. PM8.4-510-3950: Cooling Tower, Forced Draft. PM8.4-710-3950: Fan, Axial, 36” to 48” Diameter. PM8.4-710-3975: Fan, Axial, 36” to 48” Diameter. PM8.4-740-1950: Fan, Fume Hood, Utility, Exhaust. PM8.4-760-1950: Fluid Cooler, 2 Fans (No Compressor). PM8.4-810-1950: Package/Rooftop Unit, Air Cooled. PM8.4-840-1950: Package Unit, Computer Room. PM8.4-850-1950: Package/Rooftop Unit, with Duct Gas Heater. PM9.2-110-1950: Motor Control Center, Electric.